Cronin Wall Properties are delighted to welcome this wonderful 3-bedroom terraced property to the sales market. Boasting a bright and spacious interior which has recently been painted throughout with newly laid carpets. Additionally, there is an exceptionally large, corner garden which is not overlooked from the rear complete with patio area. The location is perfect, nestled in a desirable residential setting close to many amenities in Castlemartyr Village such as National School, Shops, Chemist, Sporting Facilities, Café etc. 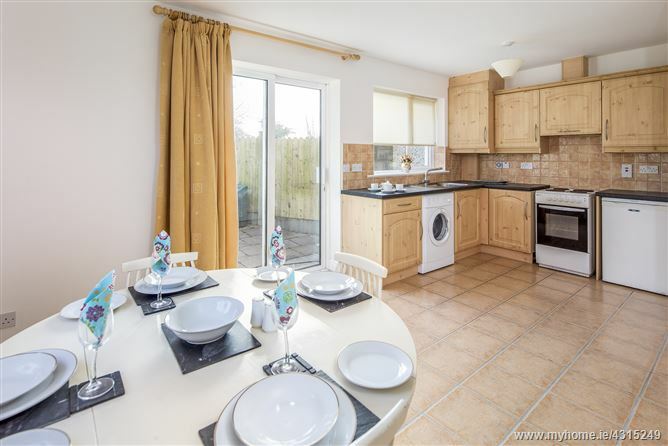 Castlemartyr Village offers all the advantages of country living, close to the sea with easy access to Cork City.This property will undoubtedly appeal to first time buyers seeking a ready to move into home. Accommodation consists of: Entrance Hall, Lounge, Kitchen/Dining Area, Guest W.C., 3 Bedrooms & Bathroom. Living Room: Carpet, T.V. point, curtains & pole, power points & radiator. Kitchen: Tiled floor, built-in units & eye level presses, W/M, cooker, fridge, blinds, curtains & pole. Guest W.C.: Tiled Floor and ½ wall, W.C., W.H.B. Bedroom 1: Carpet, curtains & pole, light fitting, power points & radiator. Bedroom 2: Carpet, curtains & pole, light fitting, power points & radiator. Bedroom 3: Carpet, blind, power points, radiator & light fitting. Bathroom: Tiled from floor to ceiling, bath with electric shower, light fitting & radiator.